Invisalign clear braces are a revolutionary new way to straighten teeth. The days of wire brackets that are glued to your teeth and tightened with arch wires is gone…at least for some people. Invisalign braces are clear aligners that were developed because they are faster, easier, more comfortable, and inconspicuous, so they are perfect for older teens and adults. However, Invisalign clear aligners aren’t for everyone. 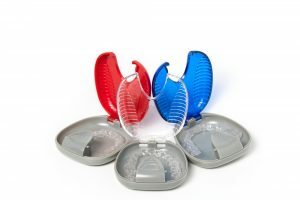 Find out here if Invisalign will work for you. Large Gaps: If there are large spaces between your teeth, metal braces may be a more suitable treatment. Generally, if the combined total of all gaps per arch is more than 6mm, metal braces will be the treatment of choice. Severely Rotated Teeth: If you have teeth–particularly your lower eyeteeth and/or premolars–that are rotated (meaning turned or twisted) by more than 20 degrees, metal braces will be the treatment of choice. Severely Tipped Teeth: If your teeth are tipped or angled more than 45 degrees from what is considered normal, metal braces are a more suitable treatment. Other problems: Other situations that require metal braces include deep, severe overbites; opens bites and other skeletal-based malocclusions; and more. If you are an older teen or adult who is interested in finding out more about Invisalign clear braces, schedule a complete evaluation and find out if Invisalign is right for you.